The current original title certificate that has been signed over to you by the seller. A completed Wisconsin Title and License Plate application. This form can be downloaded online. Documents to proof your identity. Your existing license plate if you are transferring the title. If you are applying for new plates, you will need to pay the applicable fees. Payment of registration fees, sales tax, title fee, local sales tax fee if applicable. You can pay through check, money order or cash. Your money order or check must be payable to the Registration Fee Trust. Once you have all of the above with you, you can then visit your local registration provider or DMV service center to apply for motorcycle registration and title. You must obtain license plates within two days of motorcycle purchase. 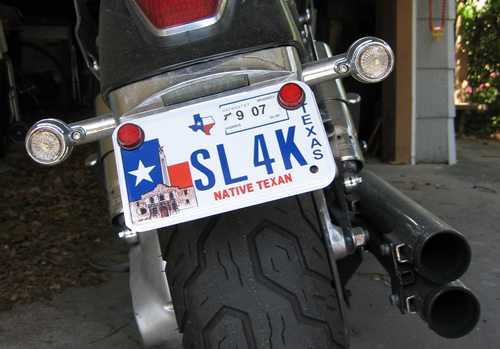 If you have old license plates, you can use them on your new motorcycle awaiting transfer. Otherwise, you will need to obtain temporary plates to use on your new motorcycle until you obtain permanent one. You may also request personalized and specialty license plates. The state has an online License Plate Guide that list fees and other details you will need when ordering your plates. For personalized and specialty plates, you will need to pay the regular renewal fee plus additional $15 fees. You must renew your motorcycle registration annually. The DMV will send you a renewal reminder through mail about one month before the expiration of your current registration. Your renewal notices contain all the information that you will need to renew your motorcycle registration. You will be eligible to renew your registration online if the renewal notice has a Renewal Reference Number. The DMV will mail you a duplicate renewal notice. The type of sticker needed. Your full name as it appears in your legal identification documents. The DMV will send you duplicate stickers within two business days at no charge.